July 13, 2015 July 13, 2015 / Steve M.
Another scarce and fragile item in the ephemera department, it is noticeable that this is a much more meagre offering than some of the quite elaborate and lavishly presented Paris Olympia catalogues, ironically this very simple fact makes it less likely to have survived, so a very welcome addition to the collection. Presented here in full because as part of the collection it is not available to trade or for sale, but I will copy a PDF version on request. Any questions? please ask, just leave a comment on this blog and I will get back to you. 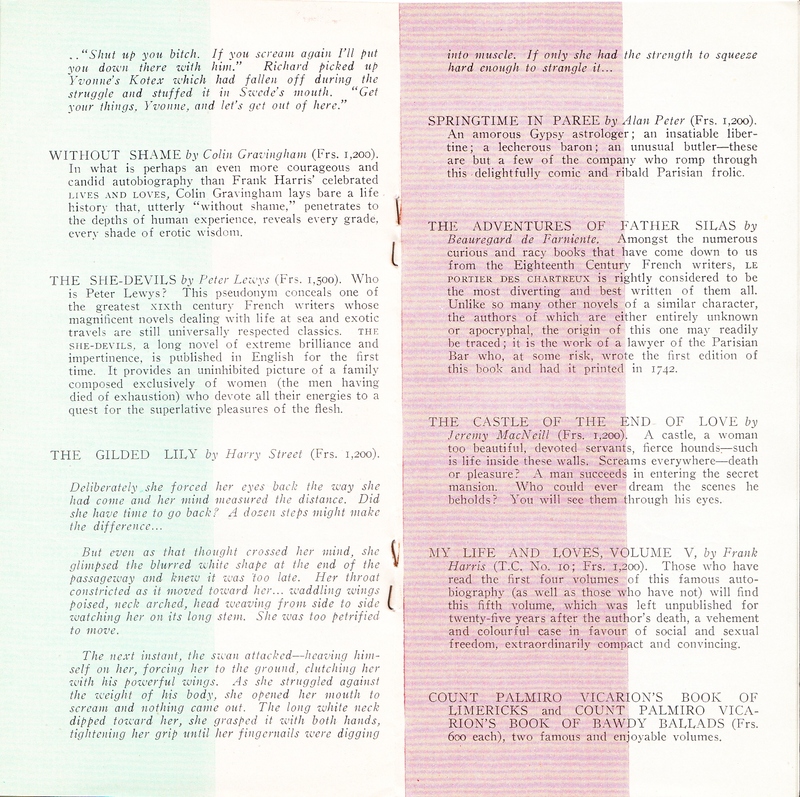 The bibliographical description is courtesy of Patrick Kearney, The Paris Olympia Press, The Liverpool University Press 2007. The index number is the actual location of the description in the bibliography. 14.9.1 1959. 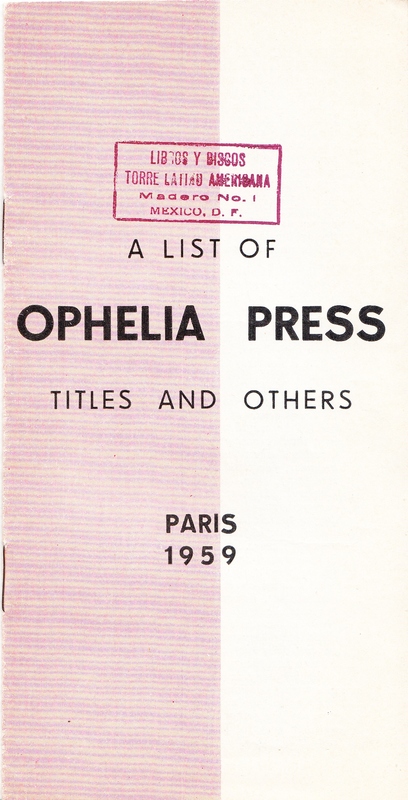 A List of Ophelia Press Titles and Others. 18.5 x 9.6 cm. 16 pp. incl. 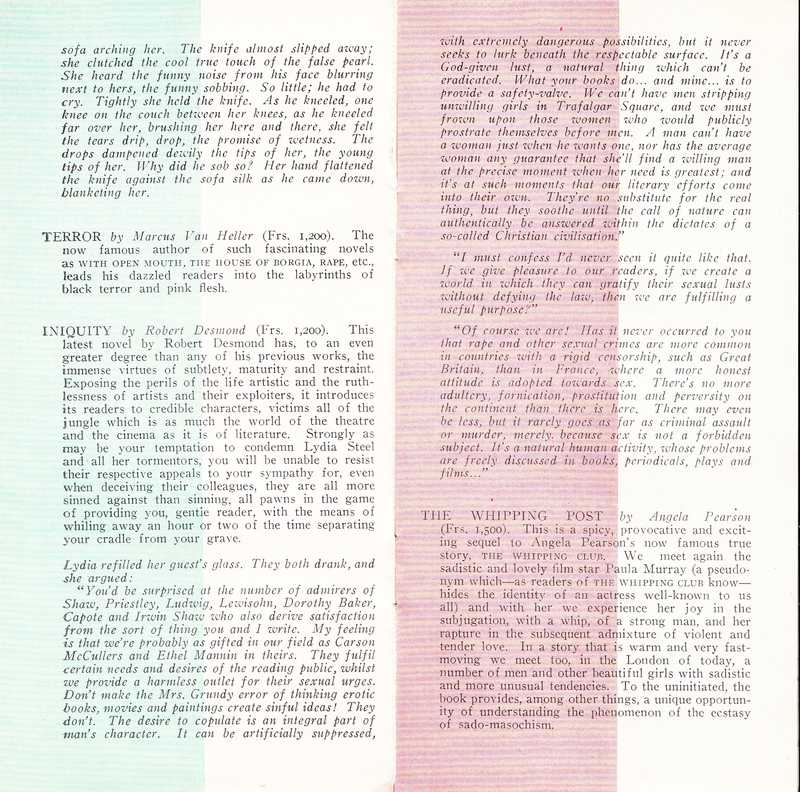 plain, typographical wrappers. Contains brief extracts and write-ups of Sexus, Plexus and Nexus (T.C. 39, T.C. 68 & T.C. 72; 3,000 francs apiece). The Watcher and the Watched (T.C. 69, 1,500 francs). Terror (1,200 francs). Iniquity (1,200 francs). The Whipping Post (1,500 francs). 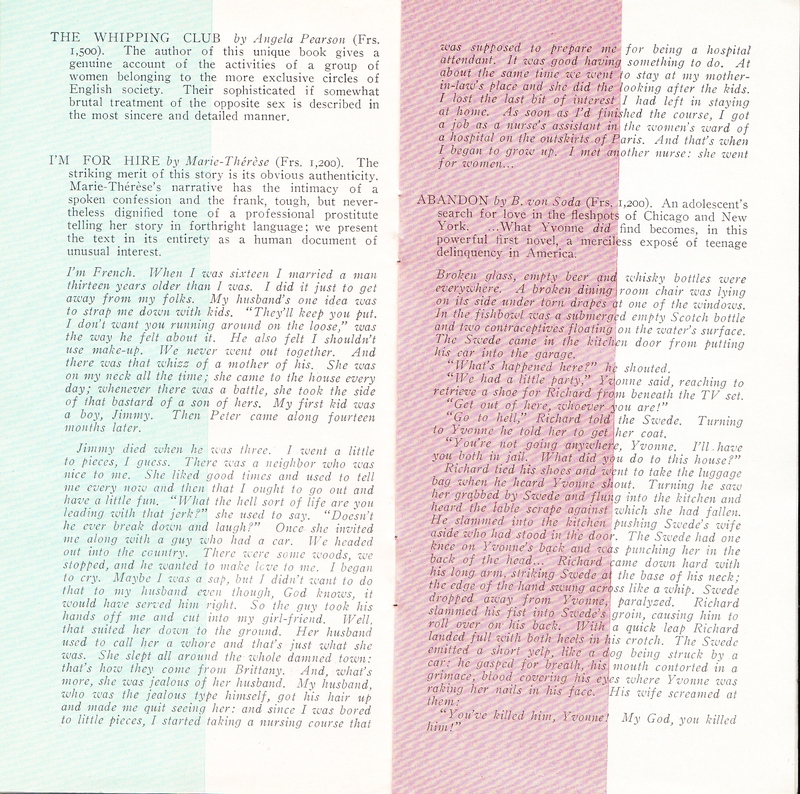 The Whipping Club (1,200 francs). I‘m For Hire (1,200 francs). Abandon (1,200 francs). Without Shame (1,200 francs). The She-Devils (1,500 francs). The Gilded Lily (1,200 francs). Springtime in Paree [sic] (1,200 francs). The Castle of the End of Love (1,200 francs). My Life and Loves vol. V (T.C. 10, 1,200 francs). Count Palmiro Vicarion‘s Book of Limericks and Book of Bawdy Ballads (600 francs apiece). Lust (1,200 francs). The House of Borgia Vol. 2 (1,200 francs). The Fetish Crowd (T.C. 73. 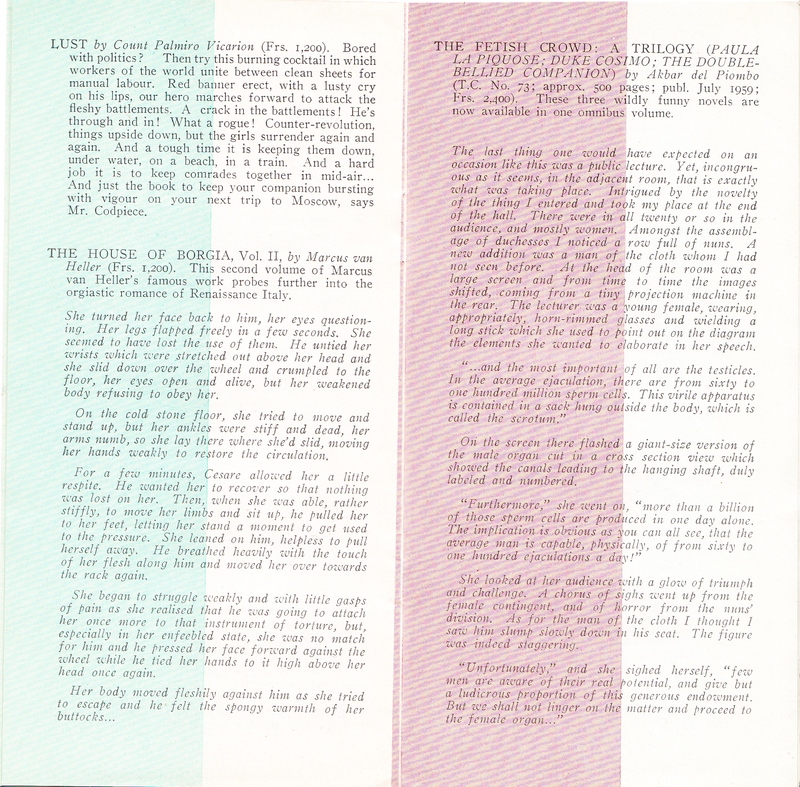 Announced for publication July 1959. 2,400 francs.) The Ordeal of the Rod (1,200 francs). 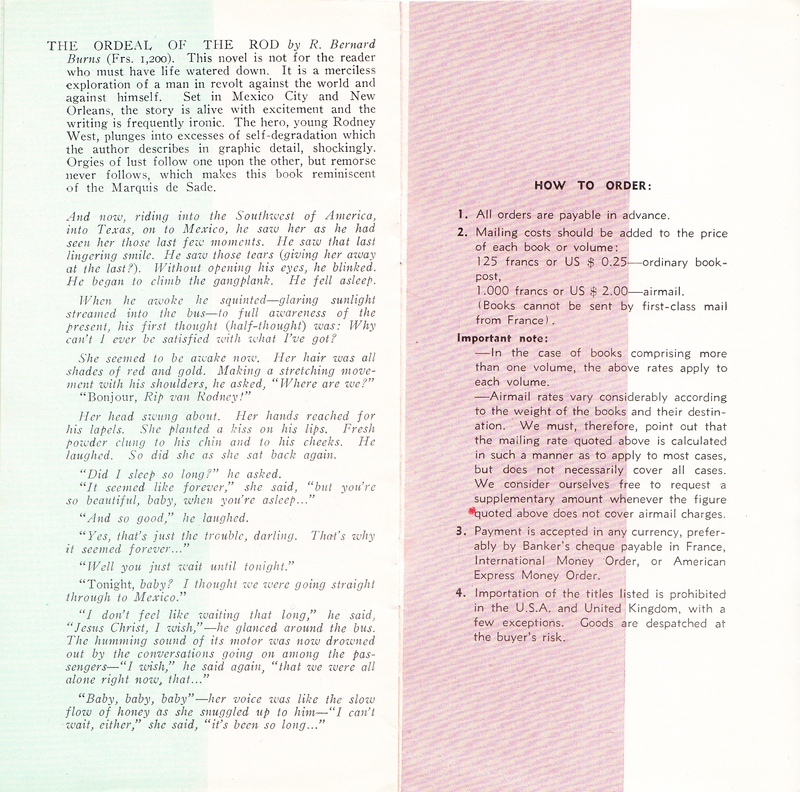 Pages [13,14] are taken up with priced catalogue, and p.  carries ordering instructions. Backpage p.  is blank. 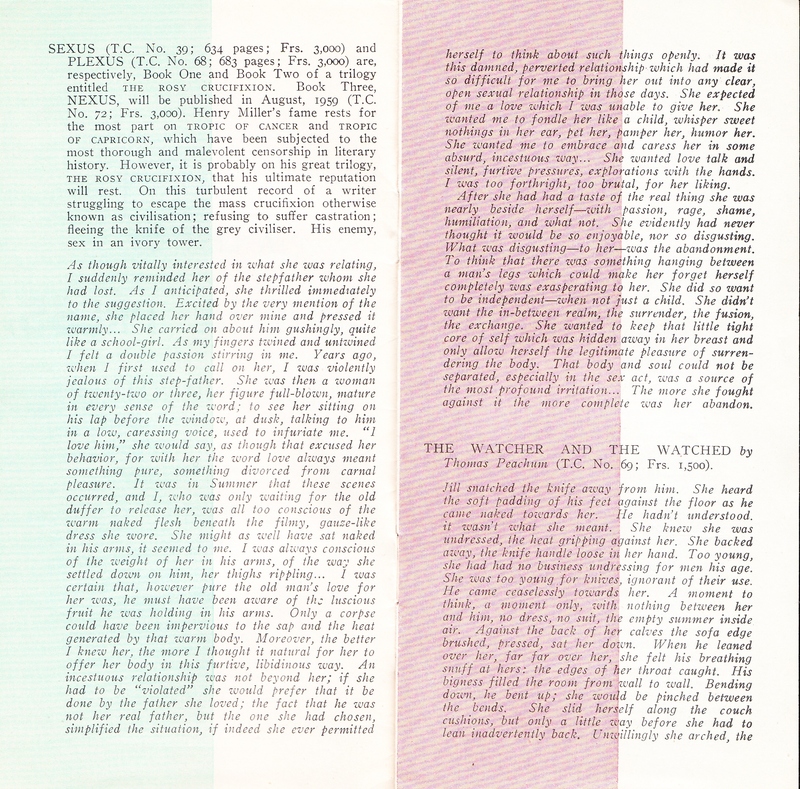 Notes: (1) Nexus was never published by the Olympia Press, and T.C. 72 never allocated a title to replace it. 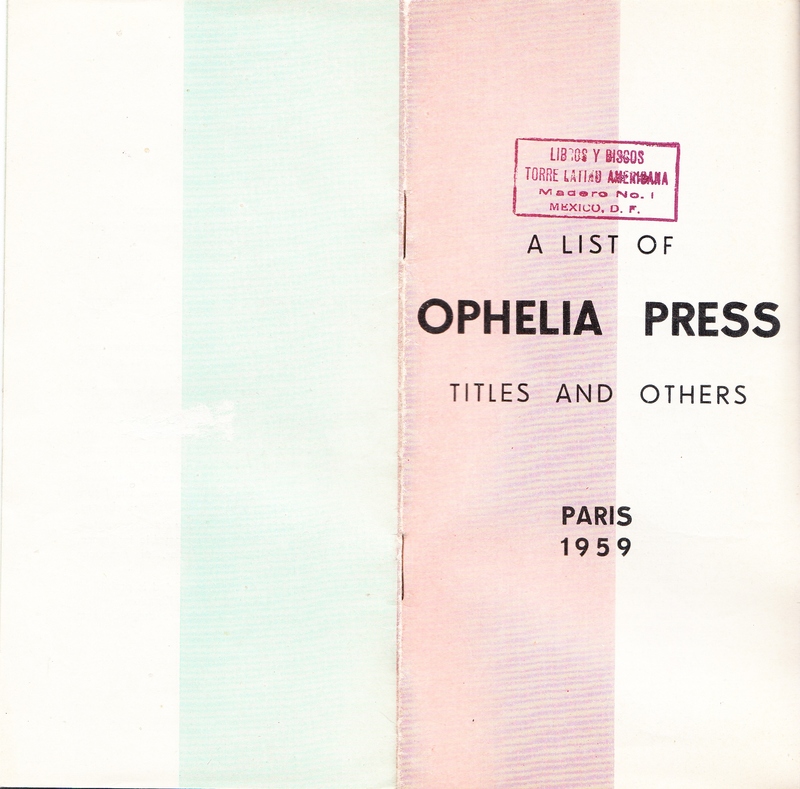 (2) I‘m for Hire, listed also in the catalogue section as an Ophelia Press title, never appeared under that imprint. (3) Springtime in Paree appeared as Springtime in Paris. PDF copy available free on request.